Infinix Hot 4 is one of the latest devices of Infinix in 2016, originally lunched in August and packed with lots of power. 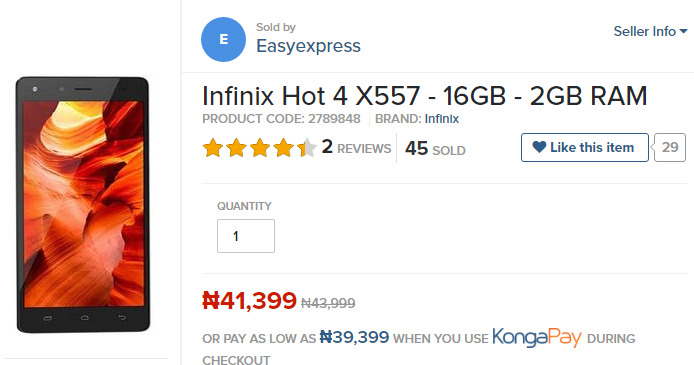 It features a long lasting battery life of 4000mAh battery capacity, its price has been reduced on Konga recently. Aspiring persons that loves this 2GB Ram with 16GB storage can now it at a cheap price now while it last. A summary of the HOT4 features is fingerprint reader, up to 128GB MircoSD card expansion to handle all your files, runs on Android 6.0 Marshmallow OS, mega 4000mAh removable battery capacity, Smart voice, 8MP main camera and 5MP selfie camera. When you buy this device, in the pack are ther Infinix Hot 4 devices, Power Adapter, USB Cable, User Guide, Earphone and a Warranty card.